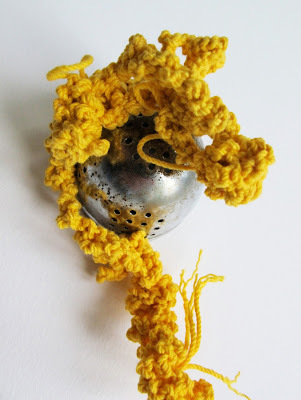 I've been writing about my daily drawing adventures for a couple of weeks, and finished up that thread on Monday with the remark, "And now that I've brought you up to date, I promise to write about fiber art for a while, not drawing." Then someone left a comment, "You say drawing and fiber art like they have no connection with each other." So let me defend my remark. First off, what are we talking about? To me, "fiber art" means my serious work in quilting and other fiber formats; work that I would enter in shows or want to be in my career retrospective. I think I'm pretty accomplished in these formats: I can often get into the good shows, maybe even win a prize, I can teach and write books about this line of work. In addition to my serious fiber work, I always have some side projects going that don't rise to that level of importance or achievement. Specifically, every year I do a daily art project, often chosen as a way to force myself to try something new and unfamiliar. I did two years of daily photography and three years of daily collage. In both cases my initial apprehension and inexperience gave way through practice to better technique, a better eye, a personal style, but I can't say that they had any influence on my fiber art, or vice versa. 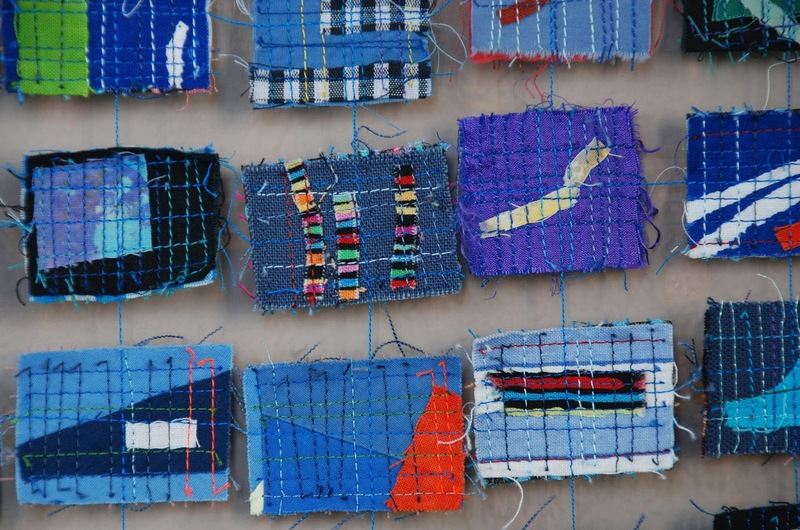 For many people, of course, there's a big connection between drawing and fiber art. Lots of fiber artists use drawing as an integral part of their serious work, such as these two examples from Quilt National '15, where the quilted line forms the image. I don't think that's going to happen in my own work; I'm going down a very different road these days. I admit that a few times in my daily drawing I've used curvy lines that greatly resemble a particular quilting style that I used to do a lot, but I didn't feel the patter of little feet migrating from one medium to the other. 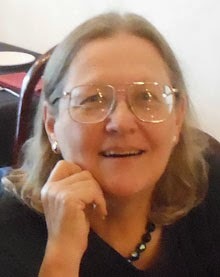 That said, I know that it often takes a long time for the artist to recognize connections in her own work, perhaps not until an outside observer points them out. I used to think that my "postage stamp" quilts and my standard-format quilts were two entirely different bodies of work, until somebody commented that they're both little bits held together by fragile bonds. Head slap / of course!!! I have also noticed commonalities among my different approaches, such as the way text keeps creeping in despite my alleged attempts to keep it out. 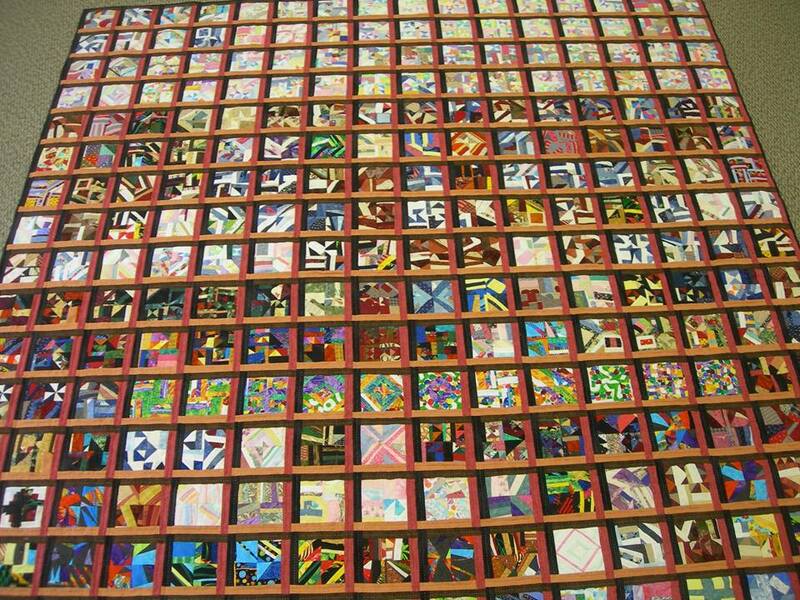 That certainly happened in my quilts, again during the three years of daily collage and it may be wanting to occur in my daily drawings. 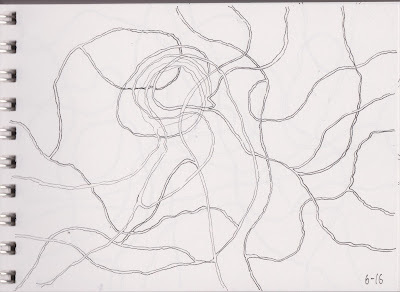 And I also see a recurring theme between my "tangle" drawings and my 3-D knotted constructions, although the sketchbook knots are a whole lot looser than those in real life. I guess they too are fragile bonds barely holding things together. So are there connections between drawing and fiber art? At this point, for me, I would say not many. But who knows what might develop -- or what I might come to recognize -- in the future. My daily art drawings started to organize themselves into series as I deliberately explored various styles of abstract, doodle-like approaches. I realized that I love to work in ink, and fastened on the finest Micron pen as my tool of choice. 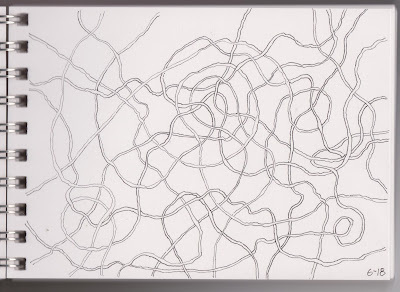 I realized that "roads" made of two closely spaced lines were a favorite and recurring motif. 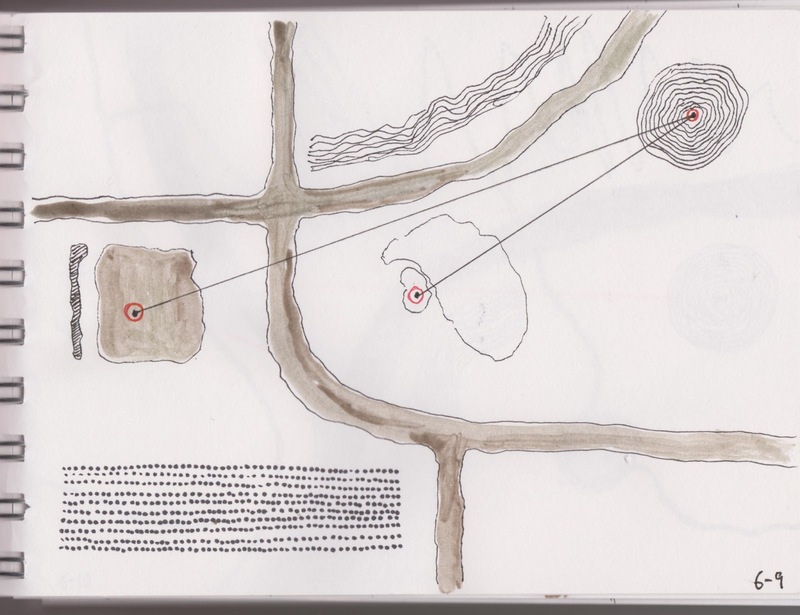 I had been making maplike drawings with lots of details such as rivers, beaches, mountain ranges and variously textured fields. 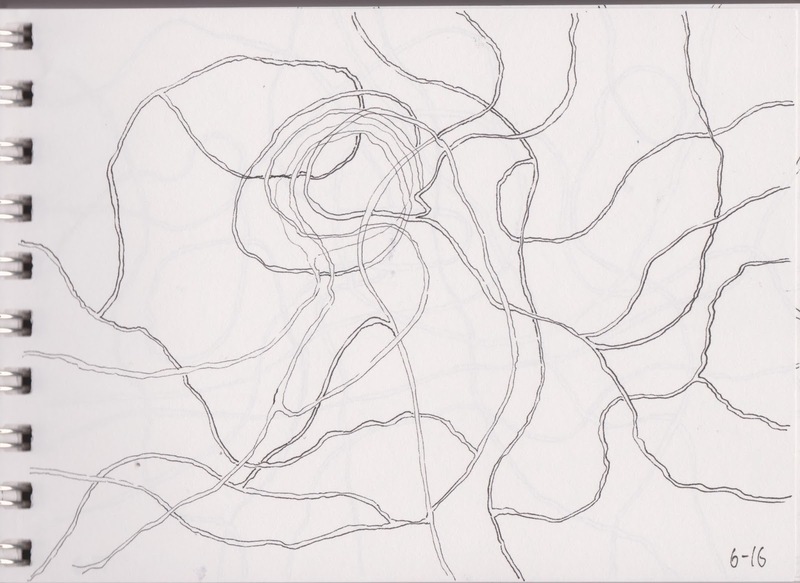 But one night I drew just roads, and they started to tangle up in the middle of the page. Clearly a direction that I had to pursue! 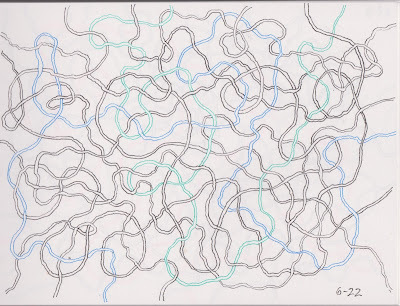 On subsequent days, the tangles started to fill more of the page and become more complicated. And when one road met another, it would go over or under it like a freeway, not make a grade-crossing intersection. I wasn't thinking of these as roads any more; now they looked more like threads or yarns. How many times in my long career as a sewist have I had to untangle piles of thread or yarn that look just like this! 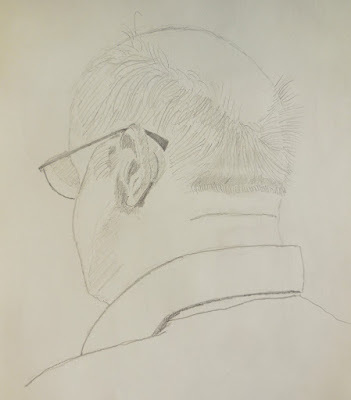 You can check out all my daily drawings at my daily art blog HERE and see what has happened with this approach in the last month. 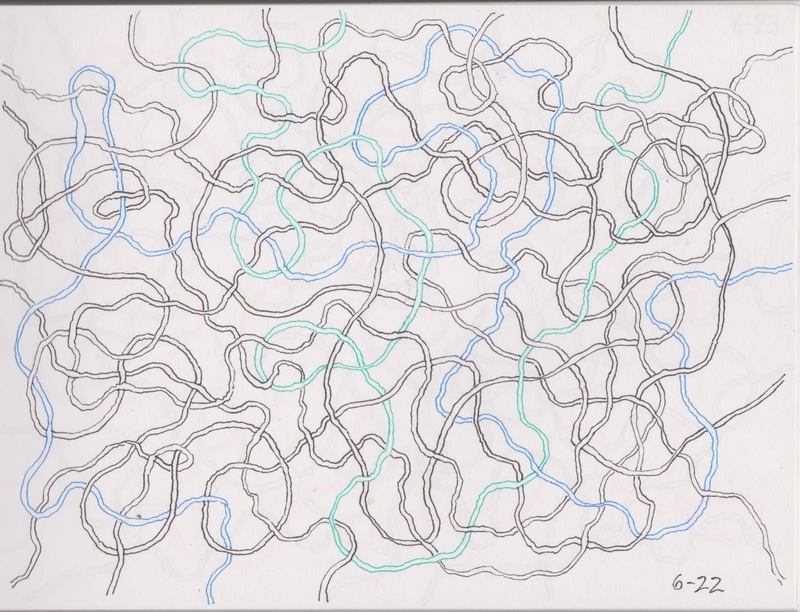 The only problem was that I discovered that it was taking me two or three hours to make these very detailed tangles, and that's a lot more time than I am willing to invest in daily art. 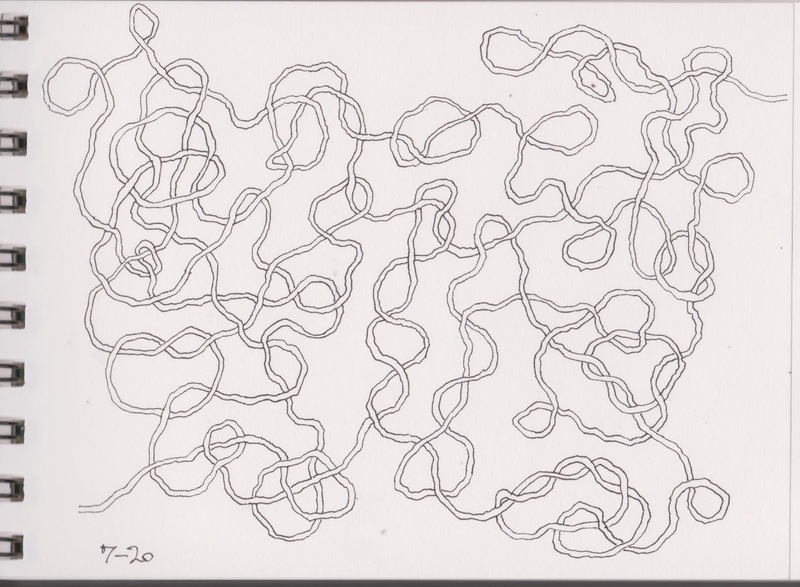 So I decided I had to ration myself: tangles on days when I could draw while visiting with other people or watching TV, less detailed drawings (or smaller tangles) on days when I was working alone. I had a blissful week of tangles recently during a family vacation, and could sit overlooking the lake, draw and talk all day! And now that I've brought you up to date, I promise to write about fiber art for a while, not drawing. 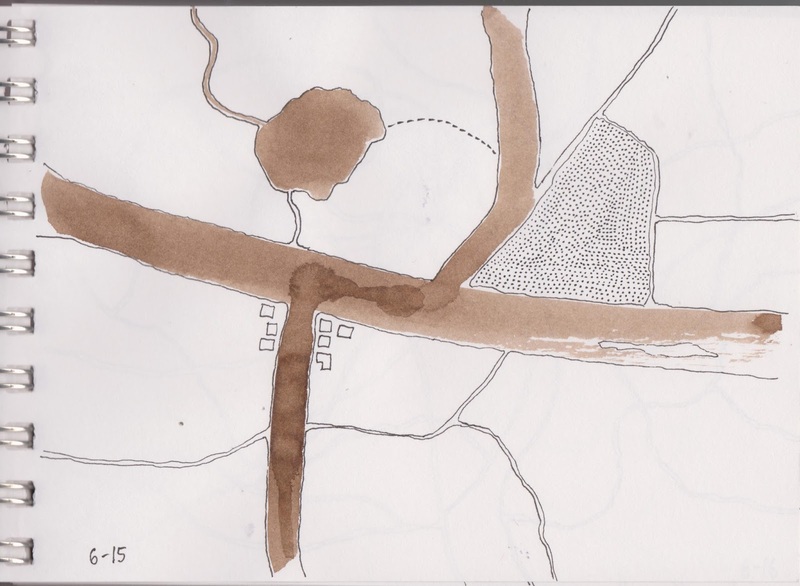 Continuing with the combination of thin wash with fine ink lines, I started drawing maps. Sometimes the wide wash made roads, other times rivers and lakes. 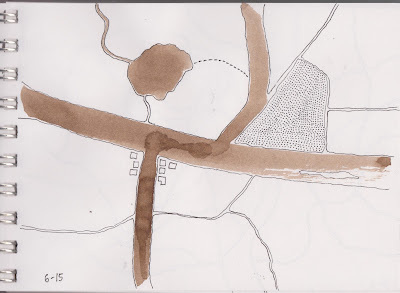 I would outline the wash areas with lines, then enjoyed putting in more details with the pen. Always experimenting with different kinds of shapes and different kinds of marks to fill in the shapes. Working in series felt good, as I discarded approaches that didn't work so well and continued to practice approaches that did. 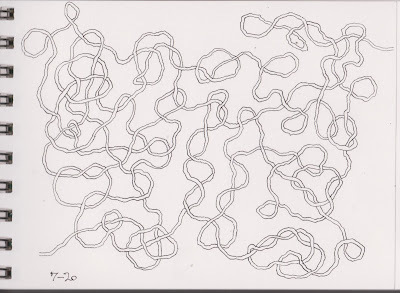 But no matter what else ended up on the page, I almost always had "roads" made of two closely spaced pen lines. That seemed to be a style that I did naturally. I like the way the road isn't always of uniform width, because the lines aren't perfectly straight and the bumps don't always correspond. I found myself going into zen state when I would draw the roads. Sometimes I would deliberately hold the pen way up at its top end to introduce some uncontrolled jitters into the line. I almost always finished my daily map drawing with a tinge of regret because I didn't want to stop drawing those roads. Fortunately I realized what was going on and decided to let the roads keep going on and on. Tomorrow I'll show you what happened then. In mid-May I was drawing at my desk and noticed a bottle of brown india ink lurking behind some other stuff. I think I had been tidying up and the ink was newly visible to the naked eye, and it called to me. I grabbed a brush and made a loose circular form, then doodled around it with my 005 Micron pen. Even though the ink was not behaving very well -- it had globs of pigment instead of a smooth solution -- I liked what was happening, especially the contrast between the light wash and the black ink lines. I experimented with this approach for a week or more. 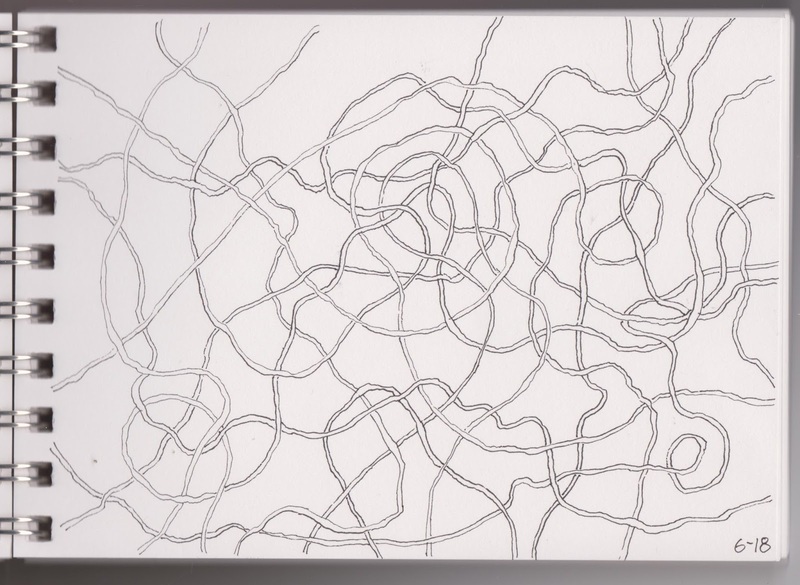 I was experimenting with different kinds of doodles around the edges and was particularly taken with the curves and shapes drawn with two parallel lines, as in the sketch below. The second line gave more weight and made the mark more visible, but still had the delicacy of the very fine pen point. I was happy with these drawings; again, I felt that I was developing my own ideas instead of just randomly drawing whatever showed up on the table. My second sketchbook for the daily art project had brown paper, and I quickly learned that pencil didn't show up very well. So I started using either a Sharpie or a fat Micron pen. During a boring meeting in early April I found myself doodling buildings or blocks with distorted perspective and slots or holes cut into the sides. After a while I realized that I should be working in my sketchbook instead of on the edge of my agenda. I drew buildings for a couple of weeks, realizing that I liked going back to the same concept over and over. Each day's drawing seemed to come naturally from the previous day's; I tweaked the concept, experimented with different methods and densities of shading, came up with new ways to draw holes and slots in the buildings, tried different vantage points. Some days the perspective was very distorted, other days it was more realistic. I got the same familiar buzz out of working in series that I have always felt when my quilts are in a groove. And most important, I felt for the first time that I was working from my own imagination, finding my own voice and refining my style by drawing the same subjects over and over. Then I ran out of pages in my brown-paper sketchbook and stopped doing doodle buildings. With a new white sketchbook I thought it would be exhilarating to go back to pencil and try something different. But I floundered. 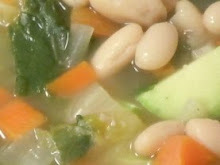 Update: linking this post to Nina-Marie's blog -- check it out to see what other fiber artists have been up to this week. I've told you about several of the routines that I've adopted this year in my attempt to overcome my lifelong terror of drawing, and what I've learned (or not). Besides the positive learnings, I've learned something very important in the negative, namely that I don't really want to master realistic drawings. When I decided to confront drawing head-on, I had several objectives. I wanted to learn about the various drawing tools -- pencil, charcoal, pen, brush -- and how they worked. I wanted to figure out which of those tools I liked, and which were giving me marks that I was proud of. Eventually I want to develop a repertoire of drawing approaches that I could use in my actual art practice, not just in my sketchbooks. My daily art started out as miscellaneous subjects. Every day I'd have to find something to draw; often a small object or piece of fruit that happened to be on the table, or something I drew from a YouTube video, or a random doodle. Some days turned out better than others, but every day I had two challenges: first, finding a subject, and second, actually drawing it. 1. My most important tool in realistic drawing was probably my eraser. 2. I didn't want to be an artist whose most important tool was an eraser. 3. While it might be fun to draw bananas or scissors now and then in my sketchbook, there was no way that I was ever going to incorporate them into my actual art practice. 4. I love to work in ink, especially the very finest of pens. I like the fact that you have to live with the line you draw (see realization #2). I love working with a dip pen and liquid ink, but it's way more efficient to use a Micron pen. 5. My hand is not steady enough to draw perfectly straight or perfectly curved lines, but I love the look of slightly unsteady lines, so I might as well embrace the flaw. 6. I like abstract, doodle-like drawings more than pictures of actual objects, probably because they allow me to make intricate, complicated compositions. 7. I do better when I work in series, exactly what I have been practicing and preaching for years in my quilting practice. Tomorrow I'll start showing you how those realizations are playing out in my daily drawings. Spoiler alert: I am so delighted with what's happening, I can hardly wait to get up in the morning and get my sketchbook! As part of my drawing confrontation, I've joined a small group of artists who draw from a model once a month. This is really challenging, even with a model who knows how to sit perfectly still (unlike my husband, who got dragooned into service a couple of times for my class assignments). In a 20-minute pose you have to choose what to focus on and what to simply hint at with a few strokes. I look around the room and see what others are doing, and wonder whether I should try working in pastels or colored pencils or charcoal, whether I should clip my paper vertically on an easel instead of working on a table. I struggle with getting the proportions right, the hardest part for me. I've been taking photos of each pose and intending to go back and work on my drawings again from the photo, but somehow haven't worked up the enthusiasm to do so. We're adjourned for the summer now so I won't be doing much figure drawing for a while. When we return I think my strategy will be to focus on very small parts of the model instead of her whole body. I hope that within the limited time period I can do a good job on a small detail rather than a discouraging job on the whole pose. Meanwhile, I am enjoying the group, despite my frustration. Most of them are far more accomplished artists than I am, and most of them work in representational drawing or painting. I'm already getting a lot out of the monthly critique and discussion, and of course it's always fun to hang out with other artists. If it actually improves my drawing, I'll be sure to report back! After my drawing class ended, I dug out a copy of "Drawing on the Right Side of the Brain," a book that I had inherited from somebody but never opened. It's a method that supposedly helps you learn to draw perfectly, as soon as you can get your bad analytical left brain to go away and sulk while you draw. Then you can go into a zen state and copy exactly what you see. So simple! This method obviously works for some people, especially those whose astonishingly good "student work" is shown off in the book. It hasn't worked yet for me. I do the preparatory exercises that are supposed to turn off the bad left brain but never come close to the moment when the mysterious zen/zap converts me to a drawer. Or if I have, it's the kind of drawer that has pencils and a whole lot of junk in it. I certainly haven't been converted to somebody who can suddenly draw realistically. One of the exercises recommended in this book is to copy a photo or drawing by holding it upside down. That way the bad left brain doesn't get in the way and tell you "I know how to draw a face!!" when truth is, it doesn't. I did several of these drawings and enjoyed the process. Not being able to see exactly what you're making does help you concentrate on each particular bit of your picture rather than getting scared and distracted by the whole thing emerging under your pencil. The book showed a drawing that Picasso had done of Stravinsky, which was presented upside down, the way Picasso wanted it shown. 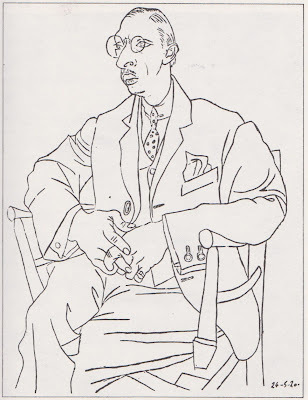 Of course, this being Picasso, he had to show off by not only showing it upside down but drawing it upside down in the first place. I copied it three times for my daily art, never managing to draw small enough to get the whole thing into my little sketchbook. The best part of such an exercise is when you finally turn it over and see what you have done, and I admit that I was usually pleasantly surprised, although I haven't done any control experiments to see whether I can copy a photo right side up. I copied some photos upside down, and then with Picasso still on my mind, I found one of his self-portrait paintings online, flipped it upside down on the screen and drew it. All of them turned out pretty good. But I'd have to do a lot more to discover whether and how copying photos helps you draw better from actual objects or models. I'm not sure how much I love this book. Admittedly, I haven't spent a lot of time with it yet, especially since most of the exercises require live models and my dear husband, the only person regularly at my disposal, isn't very good at that task. And I can't say that I am wildly eager to tackle the project. Maybe I'm wired a bit differently from the standard model, but I've never felt much disparity between the two sides of my brain. They've always seemed like equal partners, happily working together very well; I never felt that either side was slacking or deficient. So I'm not sure that getting my left brain to go home is really going to achieve much. I'll report back if I have more experience with this approach. This year I decided to overcome my lifelong fear of drawing and confront it head on by committing to a daily art project. 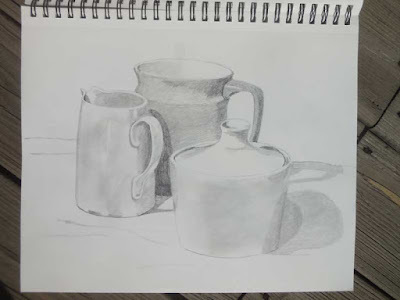 Then I doubled down by enrolling in a beginning drawing class at our local university. And tripled down by joining a group of artists who meet monthly for life drawing with a model. Finally I cracked a copy of "Drawing on the Right Side of the Brain," a famous method of (supposedly) enabling yourself to overcome all sorts of left-brain obstacles and drawing exactly what's in front of you. First, the drawing class. The semester is over and I got an A+. 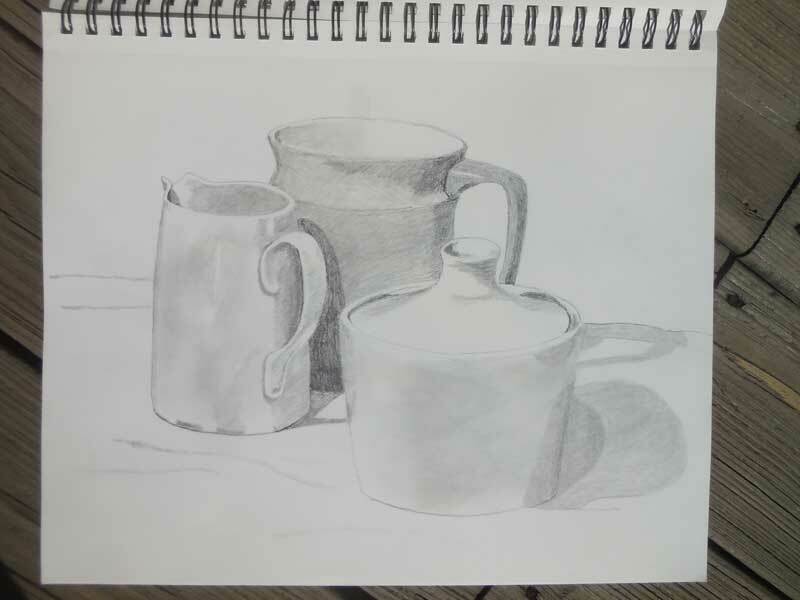 I learned to do a pretty good job of drawing white geometric shapes such as vases, boxes, spheres and cups. Not so thrilled with my chairs, trees, flowers or outdoor scenes. I learned that I like working in ink, that I like the softest graphite pencils, that I like the soft charcoal pencils even more but avoid them because you can't erase your mistakes. I learned that shadows and graduated tones improve when you blend them with a paper stump or your finger. I learned that you can go online and find any number of videos and tutorials on how to draw just about anything you can name -- and that some of them are way better than others. If you find a teacher whose styles you like (drawing style, narration style, video production style), find more videos by the same guy and learn how to draw other things. I'm glad the class is over. My textbook, "Keys to Drawing" by Bert Dodson, was excellent and some day I might go back to it, redo some of the exercises that we did in class and tackle the exercises that weren't assigned. But not right now. Next I'll tell you about my adventures with drawing on the right side of the brain. Stay tuned. Purple is out. Also brown. For old times sake, I dropped by my local Hancock Fabrics, which is going out of business. Can't even begin to estimate how many hundreds if not thousands of dollars I have spent there over the decades, although I haven't patronized it much in recent years as my sewing habits have changed. I wanted to see if there were any fabulous markdowns that called out to me. None did, except some $2 a yard fabric that will be great to wrap rolls of quilts before they go under the bed for storage, and a couple of spools of thread. I was interested to see what was left after several weeks of markdowns. If you want purple, this is your chance. Many, many, many bolts of tiny purple prints -- for some reason, many, many duplicates. I think these shelves are full of only three or four different patterns. Do the overseers of liquidation send all the purple prints to my store, and all the blue ones to Indianapolis? Same theme in the thread department, where the secondary colors were the sole survivors in this rack. I guess the people who didn't buy the purple prints didn't need any purple thread. I'm always sorry to see a fabric store go out of business. Does this reflect declining interest in sewing or just bad management? I've been to so many going-out-of-business sales over the years it's discouraging. But there are glimmers of hope, even among the carnage. The African man ahead of me in line was buying hundreds of yards of fabric. The clerk asked him if his wife, who had been gliding around in an elaborate floor-length dress and headwrap outfit, did a lot of sewing. "No," he said, "I do the sewing!" And you could tell he knew his way around a mess of fabric, expertly winding this length back on the bolt after measuring. That made me smile. 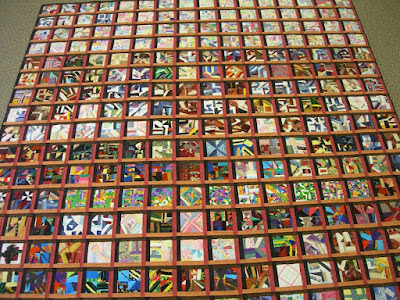 Before the turn of the century I started sewing leftover bits of fabric into 2 1/2-inch squares as therapy. When things got rough, which unfortunately was happening pretty frequently for a while, I would retreat to my sewing room (I didn't even call it a studio yet) and sew bits together. It helped, giving me the feeling of holding all the raggedy bits of my own life together. I would trim the squares using a plastic template with a little handle, and stuff them into a big plastic bag. Eventually I ended up with thousands of squares, which I sewed into a queen-size quilt, the only time in my life I have ever made a quilt that big meant to actually go on a bed. As I contemplated the quilt I could identify almost all the pieces -- these came from Robbie's baby quilt, those came from my red dress (I was still sewing garments in those days), these came from my sister's failed quilting projects. 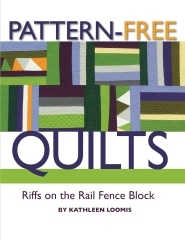 The bits were so encyclopedic that I decided to name the quilt "My Life In Pieces, Vol. 4, the 90s." (There were no volumes 1-3 but does that really matter?) 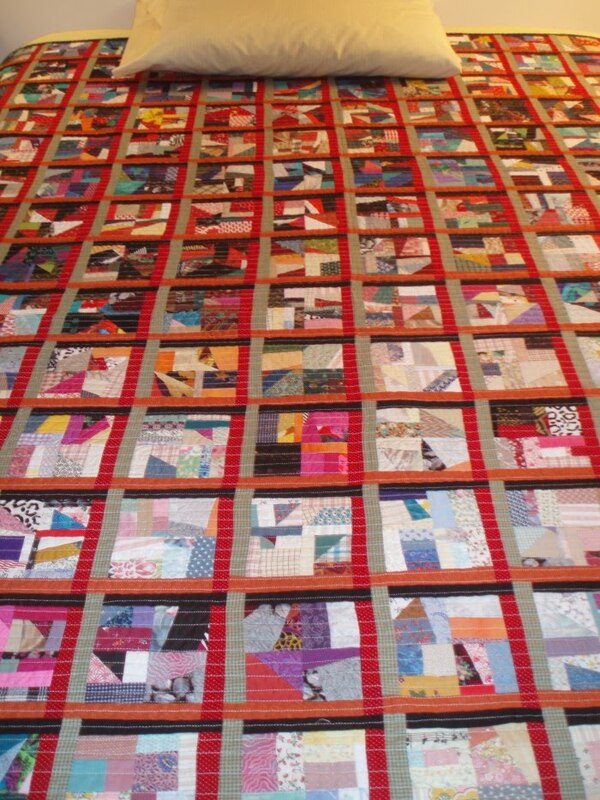 The quilt was accepted into the AQS show in Paducah, where it was spotted by an editor of the AQS magazine, who was intrigued by the title and asked if they could feature it in the magazine. So I wrote an article about the quilt and how it was made, along with project directions in case anybody wanted to make one like it. That was in 2005. 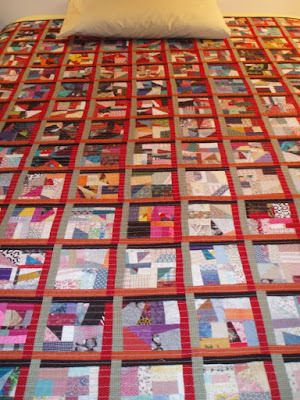 Betty Mlejnek, in Nebraska, read the article and thought it would be fun to make a quilt with her leftover bits. She too started sewing 2 1/2-inch squares and stuffing them into a bag. Time passed. It took her about as long to accumulate and process her thousands of little squares as it had taken me, but she finished it this week! She says, "Tried to just use scraps from my own work. I call it my 'nursing home' quilt. As soon as I can't remember the fabric scraps, it's time to move on to Heaven!!! I finally finished it today and wanted to thank you for the inspiration!" Back atcha, Betty -- I want to thank YOU for being inspired, and for sticking with it for a decade, and for FINISHING it, and for letting me know! It looks beautiful and I am so proud to have planted the idea in the first place. However, by now the statute of limitations has run out, and the credit is all yours.